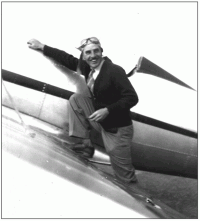 The story of Cutter Aviation follows the story of the birth of modern General Aviation in many ways. Before the passage of the Air Commerce Act of 1926, most aviation activity in the United States was completely unregulated and lacked standards for pilot licensing, aerial navigation and airspace, aircraft registration, aviation businesses and air charter operators — and as a result safety and consumer protection in any aviation activity was at an all time low. After the passage of the Air Commerce Act, legitimate aviation businesses started to take shape nationwide — with official licensing to do business at an airport or operate aircraft. In fact, the term used to describe an aviation business serving General Aviation at an airport… a “Fixed Base Operator” or “FBO” comes from that original 1926 act. Considering Cutter Aviation (or Cutter Flying Service as it was known originally) started doing business only two years after the passage of the Air Commerce Act, our history parallels the dynamic history of General Aviation in America through today. Cutter Flying Service Inc. was founded in 1928 by William P. Cutter to serve a fledgling aviation community in the Southwestern United States from its birthplace in Albuquerque, NM. Cutter Flying Service survived the Great Depression and World War II by providing needed air charter to reach ranches, towns and businesses scattered across the rugged landscape of New Mexico, Arizona and Texas. In addition, Cutter Flying Service offered aircraft sales, line and fuel services to transient pilots as a Phillips 66 Aviation fuel dealer beginning in 1938, and aircraft maintenance to support the growing number of aircraft in the Southwest. At the outbreak of World War II, when much of General Aviation and the businesses that supported it came to a halt, Cutter Flying Service became a pilot training provider for the United States military to stay in business from 1941 to 1945. In addition to basic flight training, many pilots were trained for glider operations, and the U.S. Navy designated Cutter as a Naval Air Training School as part of the Civilian Pilot Training Program (CPTP) at its primary business location at West Mesa Airport in Albuquerque. As American life returned to a state of normalcy after the end of the war, so did Cutter Flying Service. A growing business, reflecting the trend of prosperity that was being enjoyed by most of America in the post-war years, Cutter began a long-standing affiliation with the Beechcraft Aircraft Corporation in 1947 and remained one of the most successful dealers of new Beechcraft Aircraft for over 62 years. Along with aircraft sales, Cutter became widely known for aircraft maintenance service supporting Beechcraft as well as many other General Aviation aircraft being built during this time, and continued to offer fuel service and operate on-demand air charter. Cutter moved to the larger Albuquerque International Sunport in 1947 as activity at West Mesa Airport began to decline, but continued to offer refueling from West Mesa until the late 1950’s. Expanding West, Cutter Aviation, Inc. located at Phoenix Sky Harbor International Airport, first opened its doors in 1959 and offered aircraft sales, maintenance and charter to support the growing city of Phoenix. In 1988, Cutter Aviation opened a brand-new FBO facility on the South Side of Phoenix Sky Harbor International Airport and consolidated its aircraft sales, maintenance, and charter to the new facility and started providing fuel and line service. The new facility became the company headquarters for Cutter Aviation as well, though the Albuquerque location remained a full-service facility. Establishing a second Phoenix facility in 1997, Cutter Aviation opened its Deer Valley Airport location in 1997 to support the quickly growing General Aviation airport in North Phoenix. A year later, Cutter Aviation San Antonio, an aircraft maintenance and sales facility, opened in 1998, the Dallas-Addison (ADS) and Colorado Springs (COS) locations opened in 2006 and the Denver (APA) Pilatus Sales & Service Center location opened in 2018. Aircraft Sales has always been a core part of the business and as a result, Cutter Aircraft Sales has grown and added new dealerships as the company has grown. In 2004 Cutter Aviation became the dealer for new Piper Aircraft for the state of Texas under the Texas Piper name. Cutter Aviation also became a dealer for Daher Aircraft and is the current dealership for the Daher TBM line representing Arkansas, Kansas, Louisiana, Missouri, Oklahoma, and Texas. In 2006, Cutter Aviation established HondaJet Southwest, the Southwestern United States dealership for the revolutionary HondaJet advanced light jet developed by the Honda Corporation. HondaJet Southwest will provide sales and service for the new HondaJet for Texas, New Mexico, Arizona, Clark County / Las Vegas, NV, Southern California and Hawaii. The Cutter Aviation network currently operates eight locations in seven major cities in the Southwest. The Phoenix Sky Harbor, AZ (PHX), Phoenix Deer Valley, AZ (DVT); Albuquerque, NM (ABQ); and Colorado Springs, CO (COS) facilities are full-service, fixed-base operations as well as aircraft sales, maintenance and avionics, and aircraft charter and management. The San Antonio, TX (SAT); Dallas-Addison, TX (ADS) and Denver, CO (APA) facilities offer new & pre-owned aircraft sales and aircraft maintenance services. Cutter Aviation is a member of the Pinnacle Air Network, National Business Aviation Association (NBAA), and the National Air Transportation Association (NATA). A selection of photos from the history of Cutter Aviation and Cutter Flying Service from 1928 through today. Please click on a thumbnail for a larger image.